Senate President Bukola Saraki, has released a statement explaining why he was conspiciously absent at the APC National Executive Committee meeting in Abuja two days ago. 1. On Monday, the Senate President was in Benin from morning till 6.15pm, attending the Senate Roundtable on Migration and Human Trafficking, one of the interventions by the lawmaking body to source for legislative and policy solutions to one of the major problems plaguing the youth in our country today. The event was attended by Governor Godwin Obaseki of Edo State, his Deputy, Hon. Phillip Shuaib, representatives of the Governor of Delta State and Oba of Benin, international partners and many stakeholders. Dr. Saraki and his delegation, including Senators, returned to his Abuja home at 7.45 pm, while the APC National Caucus meeting was scheduled to begin by 8.00 pm on the same night. Clearly, there was no way he could have arrived at the venue on time, especially as it would be a breach of protocol to do so at a meeting presided over by the President. 2. 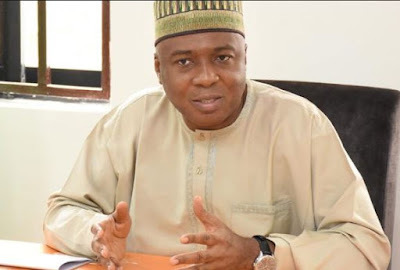 On Tuesday when the NEC meeting was holding at the APC secretariat, the Senate President was at the Code of Conduct Tribunal (CCT) where he was fighting to clear his name as the defendant in an ongoing case. Dr. Saraki did not fix the date of the adoption of briefs by prosecution and defence lawyers. The Tribunal did, and by law, Saraki must be physically present at the Tribunal as the defendant. It stands to reason that he cannot be in two places at once, and so he was unavoidably absent at the NEC meeting. 3. Let me also state clearly here that Dr. Saraki is not one to sneak into a room via the window. He would rather enter through the front door so that his entry is well noted and acknowledged. Nigerians know that when he joined the APC, he did not sneak in. Therefore, no one should attach any mischievous or inaccurate interpretation to his absence at the two meetings held at times when his whereabouts were a matter of public record. 4. Sponsors of misinformation as to why Saraki was not present at the Caucus and NEC meetings should be clear that there is no special reason behind the absence. The Senate President is not a coward. When he left the PDP in 2014, he was bold enough to inform the then President of his decision and left openly with his supporters. He therefore has no reason to be sneaking or hiding now. 5. It is incontrovertible that he is a leader, major stakeholder and founding father of the APC. Nothing has changed with regard to all these. I hope this clarification will halt the speculations, misinformation, misinterpretation, mischief and Fake News about the 'Why' and 'What' of his absence at the APC National Caucus and NEC meetings. 6. I appreciate the fact that the nation is gradually inching towards the electioneering period and permutations will be rife. I plead with analysts, commentators and forecasters to always get their facts right and not impute frivolous meanings to otherwise innocent events and occurrences.